Basically, players get cards with numbers on them in a 5 x 5 grid corresponding to the five letters in the word B-I-N-G-O. Numbers such as B-2 or 0-68 are then drawn at random (out of a possible 75 in American Bingo, and 90 in British and Australian Bingo) until one player completes a 'Bingo' pattern, such as a line with five numbers in a vertical, horizontal or diagonal row on one of their cards and wins the prize. 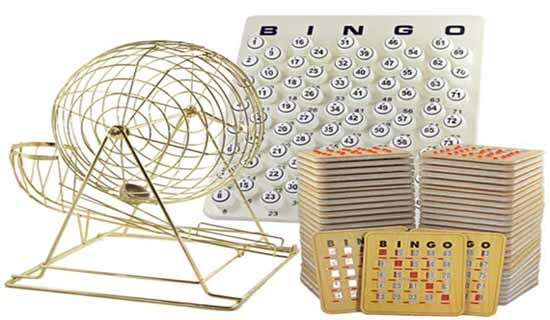 A bingo Card contains 24 numbered spaces and one free space (blank), with which you play BINGO. The numbers are assigned at random on each card and are arranged in five columns of five numbers each by five rows (5 x 5 = 25 in total including the blank square). The numbers in the B column are between 1 and 15, in the I column between 16 and 30, in the N column (containing four numbers and the free space) between 31 and 45, in the G column between 46 and 60, and in the O column between 61 and 75. Take a bingo card from the host and have a seat. Cover the "Free" space in the center of your card by sliding the red handle to the right. Listen as the bingo caller calls out a letter and number such as "B-3." Look to see if you have a "3" in the column under the "B." Slide the red handle to the right over the "B-3" if you have it. Listen as the bingo caller continues to call out letters and numbers. Slide the red handle to the right over the letter and number combinations that appear on your card. Yell out "BINGO!" as soon as you cover the numbers in a winning pattern - usually a straight line going horizontally, vertically or diagonally. Call out the numbers you've marked in your winning pattern when the bingo caller asks you. Collect your prize or tickets from the bingo caller after the numbers are verified.